Heat oven to 400°F. Lightly spread flour on rolling pin. Place puff pastry sheet on piece of cooking parchment paper; roll into 11x10-inch rectangle. Keep pastry on parchment; transfer to large cookie sheet. Score dough 1/2 inch from edge all the way around to make border. Poke dough all over with fork inside border. Bake 14 to 18 minutes or until golden brown. Meanwhile, in medium bowl, beat Herbed Cream Cheese Spread ingredients with spoon; set aside. Drop cream cheese mixture by dollops evenly over center of tart, on top of hot tart; let stand 1 minute. Gently spread cheese mixture to within 1/2 inch of edges. In medium bowl, beat oil, lemon juice, honey and 1/8 teaspoon salt with whisk. 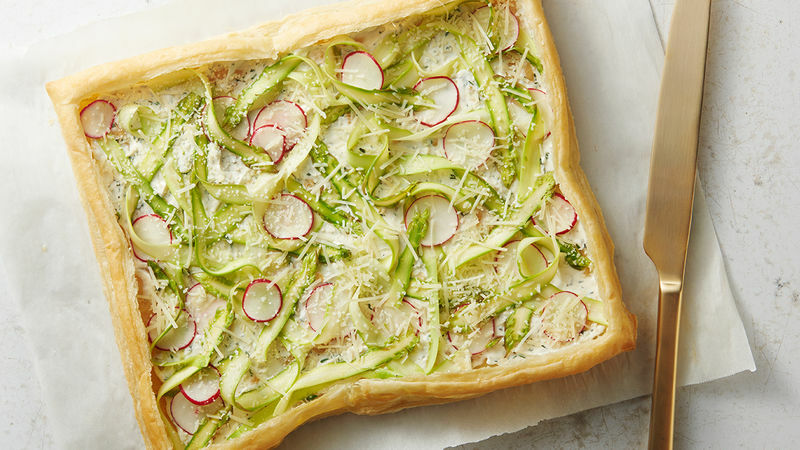 Add asparagus and radishes; toss to coat. Top tart with asparagus mixture. Sprinkle with Parmesan cheese. Cut into 4 rows by 3 rows. For an even more flavorful tart, substitute goat cheese for the cream cheese. Add an extra tablespoon of cream to help thin out the thicker cheese. To shave asparagus spears, place each spear on a cutting board and shave tip to base with a vegetable peeler until the asparagus is too thin to shave any more. Then turn over and shave two to three more pieces from the other side. The thicker the spears, the better.